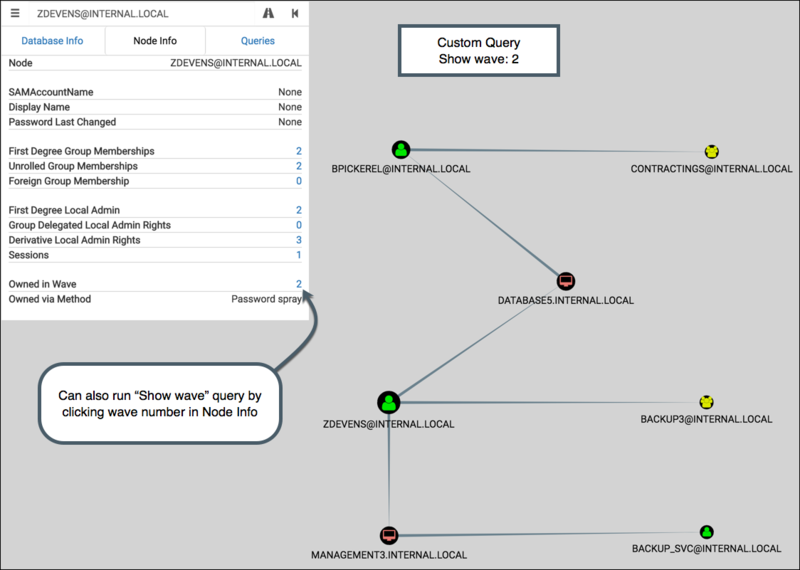 Customizing BloodHound's UI and taking advantage of Custom Queries to document a compromise, find collateral spread of owned nodes, and visualize deltas in privilege gains. If you’re new to BloodHound, I highly recommend checking out this blog, this video, or this wiki to familiarize yourself. The work being done by _wald0, CptJesus, and harmj0y is changing how red and blue teams approach risk in Active Directory environments. This post will cover how I’ve adapted BloodHound to enhance my workflow during a penetration test, complete with example usage and a source code release. It’s a bit verbose – I wanted to include why I saw an opportunity for these changes and the process for creating them. If you’d like to skip to the new features then start here. Custom Queries and database updates can be done independent of the BloodHound application. However, any modifications to BloodHound’s display requires changing BloodHound’s source. A quickstart guide for my Custom Queries and database updates can be found in the BloodHound-Owned GitHub repo. My BloodHound UI enhancements, including node highlighting and custom property display, can be found in this forked BloodHound repo. Out of the box, BloodHound works like a champ. The interface is slick, the install is painless enough considering the dependencies, and the pre-built analytics deliver actionable intelligence. What’s important to note though is that BloodHound isn’t necessarily just a tool, it’s a platform for users to build on. The foundational elements – a reliable backend, a means for ingesting, querying, and displaying data – are already taken care of. The piping is in place for users to extend the already-great features and tailor it to their specific job function or workflow. Whenever I obtain a new account or pop a shell on an engagement, one of the first things I do is run over to BloodHound and fire up the Pathfinding feature. I input the User’s/Computer’s name as my source and select Domain Admins as my target. The query only returns data when a path exists – awesome when it happens, but disappointing when it comes back empty. This process is a little tedious, and it lacks showing me the true privilege gains that come along with obtaining a new account/computer. This looked like an opportunity to add in a feature that could make my life easier as a penetration tester. Intercept LLMNR requests, collect and crack NTLMv2 hashes. 2 accounts obtained. Password spray with “Spring2017!” against domain users. 4 more accounts obtained. Use Mimikatz to dump passwords from SQLSRV01. 3 more accounts obtained. Pass SQLSRV01 local administrator hash against other hosts. 34 computers obtained. Obviously this process varies depending upon the environment, but the framework holds. We start with no credentials, and gradually our sphere of compromise increases as we control more assets. Let’s use BloodHound to answer a simple question: When a new set of nodes are owned by some method, what other nodes can we now collaterally reach? Let’s call this our wave of compromise. 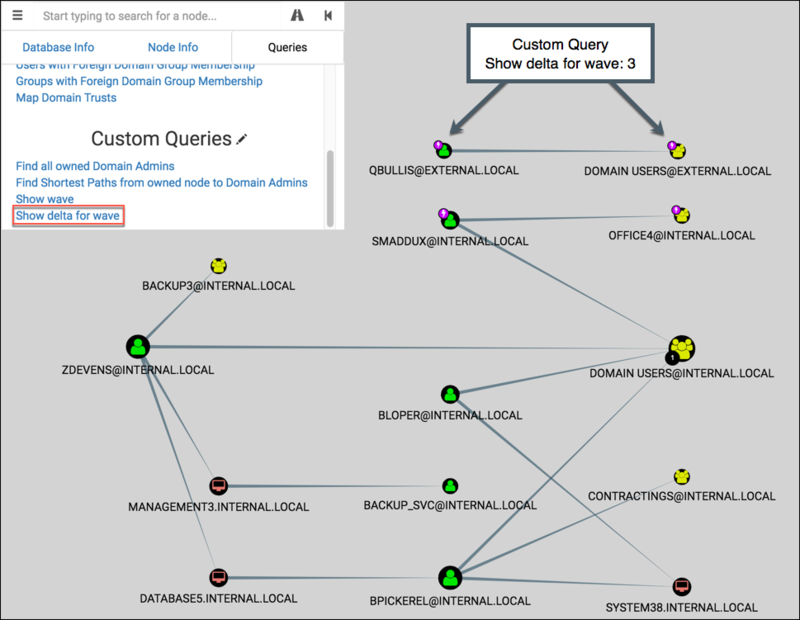 Maybe one of the nodes in that wave has a path to Domain Admins that isn’t yet represented by a BloodHound relationship. We’ll leverage this notion, that a node can be “owned” during a “wave” of compromise, to build some useful features. Going deeper means understanding a little bit about Neo4j and it’s query language, Cypher. I highly recommend reading Rohan Vazarkar’s Intro to Cypher blog post, as I’ll skip over some of the introductory concepts. 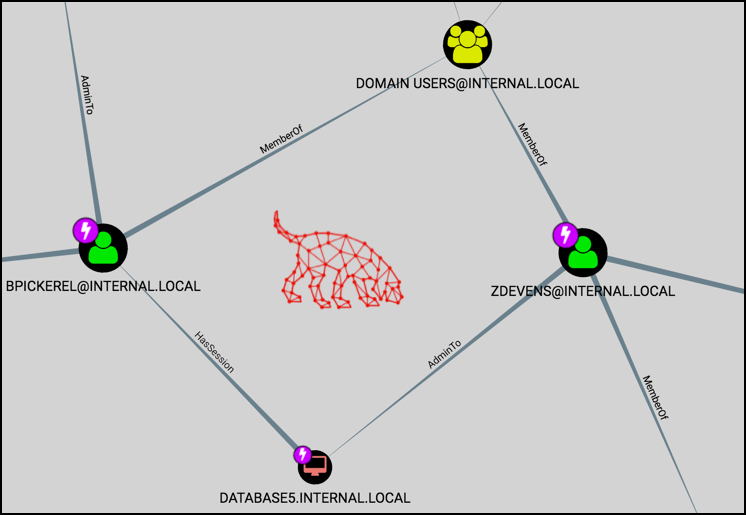 Rohan covers BloodHound’s current node and relationship structure, as well as some of the core analytics currently packed into BloodHound. It’s a useful way to document your compromise as you go, and a convenient visual aide when explaining your critical path of compromise to a client. Note that modifications to the UI like this are only possible if you tweak BloodHound’s source. I’m compiling all of my UI enhancements into a GitHub repo – if you want to try out these additions yourself then you’ll need to install the customized app from the repo. This is similar to the “Find Shortest Paths to Here” idea, but we’re now interested in the paths branching out of a node instead of those coming in. For each new node in the paths we find, we’ll set the wave property equal to the same wave value of the source node(s). Let’s see this idea in action with the example graphdb included in the BloodHound repo. If you’d like to follow along, I recommend working with a copy of the example graphdb to make starting fresh easier. > Set 2 properties, statement completed in 5 ms.
> Set 2 properties, statement completed in 6 ms.
> Set 3 properties, statement completed in 5 ms. Simple enough, right? Let’s build on these queries. 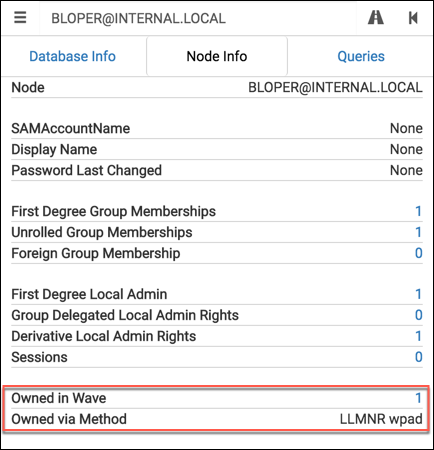 We have a way for marking nodes as owned, and we can view the ripple effect of a wave. What happens when we compromise a disjoint set of nodes via some new method? What does the delta in our access look like? It would be terrific if we could see what’s available to us now that wasn’t available to us before. We’re still looking for the paths branching out (except using the second wave as our starting point), but we don’t want to circle back to nodes we’ve already compromised. The clause AND not(EXISTS(m.wave)) ensures we don’t include any destination nodes with the wave property set. > Set 2 properties, statement completed in 7 ms.
> Set 6 properties, statement completed in 3 ms.
That’s handy. Now I know which machines I should go plunder for sensitive documents, local hashes, cached passwords, etc. The script will first query the database and determine the latest wave added – in this case it was ‘2’. It then increments it by one so that the incoming additions will be in wave ‘3’. You can override this behavior by setting the -w flag to the preferred wave value. Turns out this wave wasn’t very exciting ¯\_(ツ)_/¯ And we still have to type in our custom query in order to display the graph in BloodHound. Let’s remove that hassle and take it a step further by tweaking the UI and writing some custom queries. BloodHound added a feature in v1.2 to allow for custom queries (more info on CptJesus’s blog). This has the same effect as adding a pre-built query on the Queries tab, but the configuration file has been decoupled from the project’s source code. I found this file in OS X at ~/Library/Application Support/bloodhound/customqueries.json. 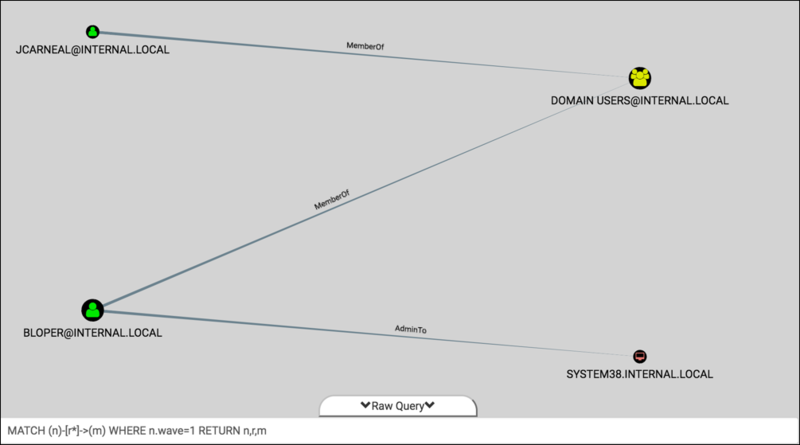 Find all owned Domain Admins: Same as the “Find all Domain Admins” query, but instead only show Users with owned property. 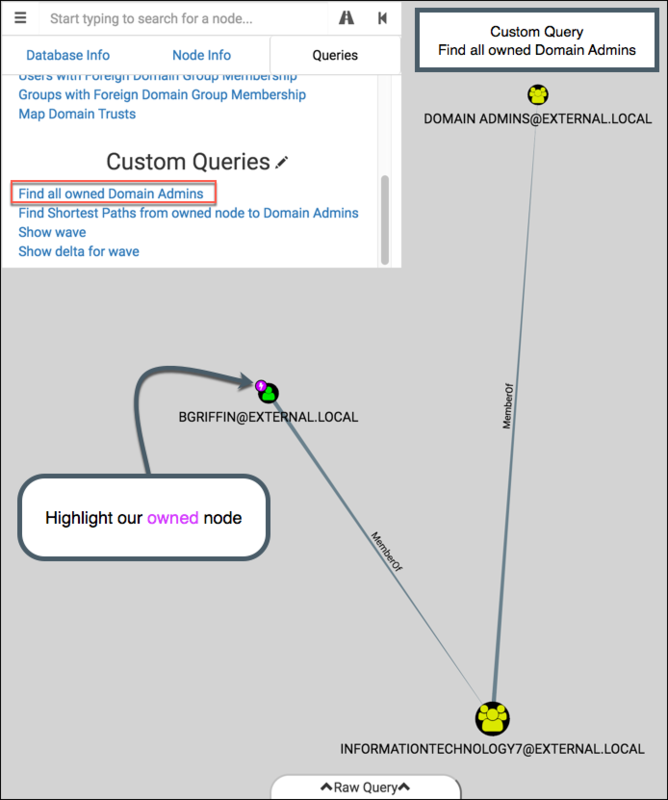 Find Shortest Paths from owned node to Domain Admins: Same as the “Find Shortest Paths to Domain Admins” query, but instead only show paths originating from an owned node. 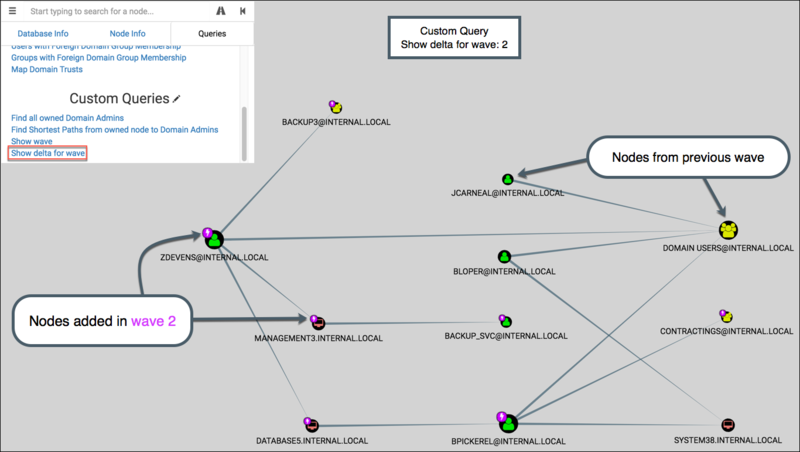 Show wave: Show only the nodes compromised in a selected wave. Useful for focusing in on newly-compromised nodes. 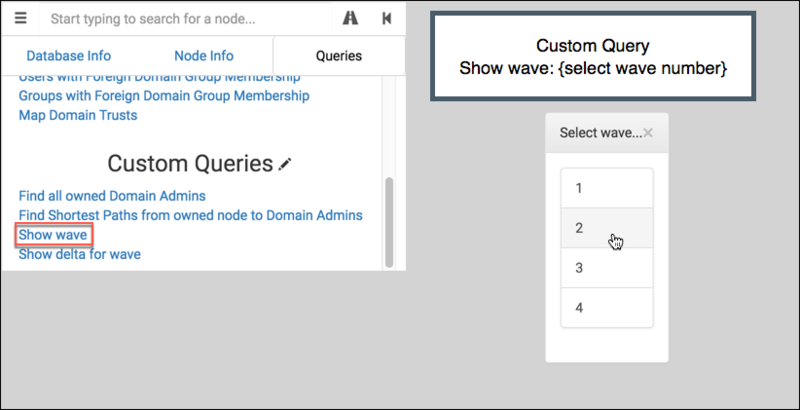 Show delta for wave: Show all compromised nodes up to a selected wave, and will highlight the nodes gained in that wave. Useful for visualizing privilege gains as access expands. Boom, we got one. 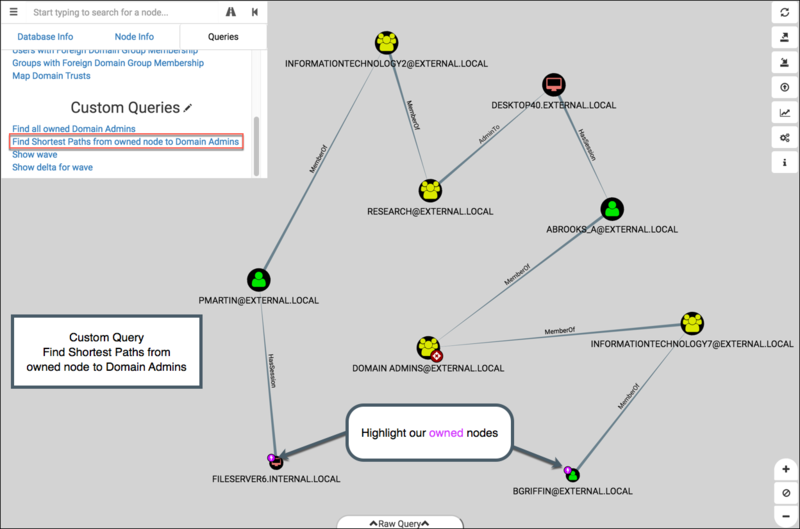 Notice that a magenta lightning bolt appears on the top-left of nodes relevant to our custom query. 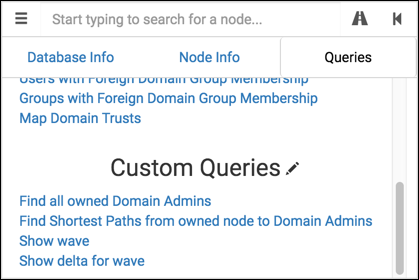 Like the additions to the Node Info tab, this feature is currently only available in the modified version of BloodHound. This displays all waves leading up to the selected wave, and then highlights the nodes from that wave. Like ‘Show wave’, it uses the pop-up picker for wave selection. I like this graph for visualizing the changes in privilege gains as it pertains to the greater context of the penetration test. 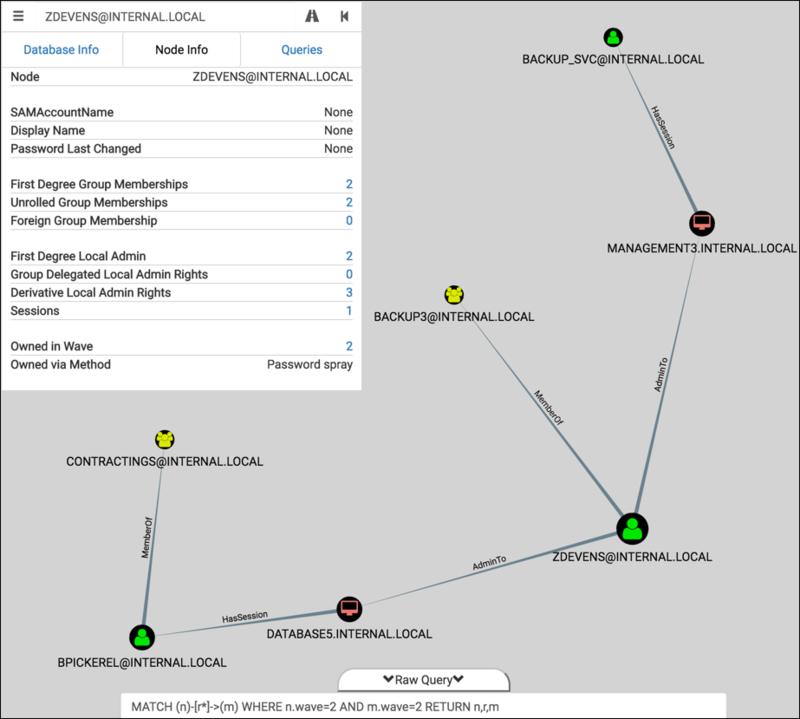 Clients like it too for the same reason – it’s an effective visual aide for explaining the collateral risk of each User or Computer you compromise. Create a new relationship (maybe “SharesPasswordWith”?) 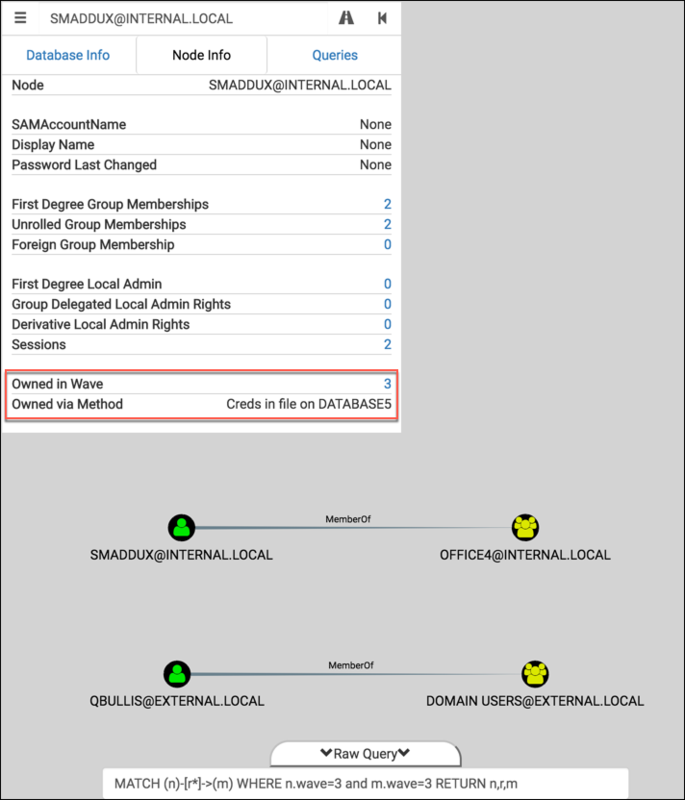 that can be used between User nodes or Computer nodes to show password reuse. A User might use the same password for their normal account and their DA account. A Computer might use the same local admin password as another Computer’s local admin. Expressing this in the form of a relationship allows us to leverage BloodHound’s pre-built queries. Add more options when a node is right-clicked. For example, “Shortest Paths from Here” or “Add to wave X”.